* Where is your flower recipient? 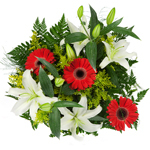 When is flower delivery needed by? 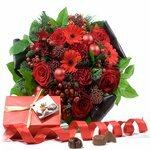 GoodChoiceFlowers.com offers flower bouquets and romantic flower baskets for international delivery to your loved ones and business associates in 180 countries worldwide with an unique chance to Build Your Unique Flower Bouquet from selected flower stems. Fresh roses, lilies, gerberas, orchids, tulips, carnations, irises delivered overseas for Birthdays, Weddings, Valentine's Day to the USA, UK, Canada, Russia and other international destinations (select country). Our Flower Baskets, Compositions, Flower Combos, Mixed Arrangements are always carefully put together by local florists in over 10,000 locations Worldwide. Please review our how to order page when you are ready to send flowers overseas. Build your Own Bouquet ?